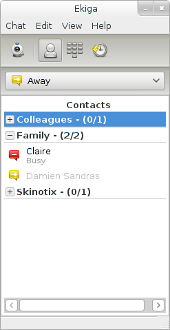 Ekiga (formely known as GnomeMeeting) is an open source SoftPhone, Video Conferencing and Instant Messenger application over the Internet. It supports HD sound quality and video up to DVD size and quality. It is interoperable with many other standard compliant softwares, hardwares and service providers as it uses both the major telephony standards (SIP and H.323). Ekiga was first released back in 2001 under the GnomeMeeting name, as a graduation thesis. In 2001, voice over IP, IP Telephony, and videoconferencing were not widespread technologies as they are now. The GNU/Linux desktop was at its infancy, and let's not speak about multimedia capabilities. Most webcam drivers were buggy, ALSA had not been released yet and full-duplex audio was something difficult to achieve. General performance could also be an issue, especially when most efficient codecs were closed source. Generally speaking, the technology was not ready yet but Ekiga was already kicking! Nowadays, everyone knows about voice over IP and videoconferencing. However, proprietary programs using closed communication protocols are dominating the market. Few people know that alternatives exist, and even less people know that using standard tools allows doing voice over IP, videoconferencing but also IP Telephony. The purpose of Ekiga has always been to be a mix between a simple chat application and a professional IP Telephony tool for the GNU/Linux destop. As a SIP softphone, it can completely replace hardware SIP IP phones and many people are using it as such. With the upcoming 5.0 release, we were very ambitious. Most of the code has been reorganized, some parts have been completely rewritten. Things are getting simplified to attract new contributors (I am now 15 years older than when I started coding on Ekiga). The user interface is completely new and is now using cutting-edge technologies like GTK+3 or even Clutter to display video. New codecs have been added, and new features are still being added regularly (I would like to complete TLS and SRTP support before the release as well as MSRP chat). We would also like to upgrade Ekiga.net before releasing Ekiga 5.0. First, there are a few shortcomings that must be fixed with the platform: users should be able to delete their SIP accounts, to modify their e-mail and password preferences, passwords should not be sent in cleartext (ouch!)... But we also need to add support for the new Ekiga features (TCP support, the upcoming TLS support, ...). As we do not have any ICE implementation yet, and as NAT is still a problem, we would like to implement Far End NAT Traversal on the new platform. All of this should come with a brand new modern look for all websites related to Ekiga and Ekiga.net. Why is it important that you help? On the contrary of many projects, Ekiga has always been developed during my spare time with a few contributors working in their spare time too. Spare time is what it is: spare time... Sometimes you have much spare time, sometimes you don't have any spare time for a few weeks. That means that progress on the project is slow, especially when you want to be ambitious. Our team is relatively small and there are many areas where we are not competent: website design is one of them. If you are a coder and want to develop on Ekiga, if you are a graphical designer, if you are a Drupal expert, if you like writing documentation, if you are a PHP developer and want to work on Ekiga.net ... Feel free to reach me at dsandras _AT_ seconix.com ! Ekiga 4.0 aka "The Victory Release" available! The legendary Linux softphone is back for more! Three years after the 3.2 release, Ekiga 4.0 aka "The Victory Release" is finally available. We are proud to announce the upcoming release of Ekiga 4.0! The code has already been frozen and we are working on the last details for the best user experience ever! The screenshots page has already been updated with the new official screenshots of the application. We are now working on the release notes. My friend Josette recently published an interview about Ekiga on her JosetteOrama.com blog. I am slowly getting back into business, and my view about Ekiga has changed a lot. I will try to post something on my blog soon. The documentation is now back online, ekiga.net has been upgraded as well, and the ekiga white pages are back too. Thanks goes to Damien Sandras! EDIT 10/09/2011: There was an issue for the writing process on the wiki which has been fixed a few days ago by Damien Sandras! The culprit was a lack of memory allocation. We are currently in the process of upgrading the softwares running on our server. The base components are already upgraded thanks to Damien Sandras. In the process our documentation (the wiki) is unavailable for the moment. We are sorry for the inconvenience.